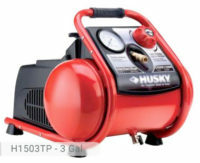 Have you ever heard of an air compressor that is portable and doesn’t make any noise? 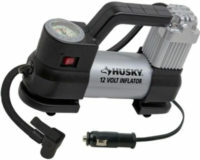 Well, the wait is over because Husky 4.6 Gallon Portable Electric Air Compressor is the answer to your silent prayer. It has a very silent flow because of its low decibel rating (65 db), making it one of the quietest air compressors in the industry. You don’t need to worry anymore when operating the tool because it is as quiet as it could get. 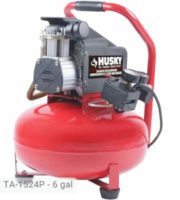 The air compressor features aluminum twin tanks which weigh 44 lbs. combined. Yes, it is very lightweight so you can transport it anywhere you want. 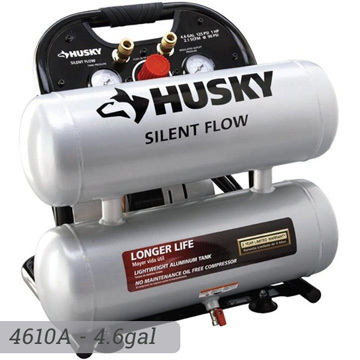 Unlike other materials used for air compressors, the aluminum used to construct the tanks of Husky’s air compressor is rust-free. The tanks have a total capacity of 4.6 gallon with motors operating with a power output of 1.0 HP. You would not experience leaks because the tanks are constructed meticulously for safety purposes. The pumps are oil free so it doesn’t need to be maintained every once in a while. It remains clean and would not cost you a lot of money for maintenance services. 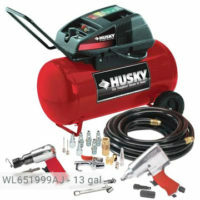 Although Husky 4.6 gal air compressor won’t be able to accommodate a huge amount of workload, it can be used for lighter tasks such as air brushing, nailing or stapling, painting, spraying, and inflation. 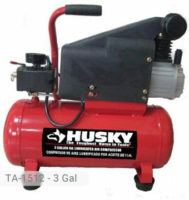 Husky 4.6 gallon air compressor can be used to power two tools simultaneously with the control panel that comes with 2 ¼ in. quick release connectors. This would save both air and time because you won’t have to disconnect one tool to connect another one. It works well with trim nailers but for framing ones, it will depend on the SFCM requirements of the pneumatic tool. You can fire brads and staples easily but for framing, the air compressor can only offer limited work. It’s better to check out what is written on the product instructions first. It is a 125 PSI unit with an automatic shut-down feature when it reaches its maximum. Although it has lower compressor tank capacity than other models, it is very convenient to use for light-duty needs that are usually done indoors because it is noise-free. You can have normal conversation with other family members even when the tool is running. Unlike other air compressors which operate through fuel or diesel, this one needs an electric power source. 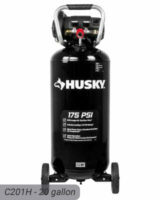 Husky 4.6 gallon air compressor is very portable. The handle above the tanks is well-placed to avoid bumps while carrying it. It is light and compact compared to other models. It has four rubber feet to protect the surface where you place it. It can also stand on its own. The dual-tanks are double-stacked horizontally which saves a lot of space in the room or garage. Unlike other models, it does not have additional components or visual accessories. However, you won’t be needing them because the gauges in the air compressor are very easy to read already and the regulators can be manipulated quickly. If you are prone to having flat tires or if you need an air compressor for simple domestic purposes, this is the ultimate tool that you need especially if noise a major issue for you. It works efficiently and quietly making it the perfect company to your home. What are you waiting for? Visit your favorite home equipment store and purchase one now! If you already own Husky 4610A model or just want to buy it you can share your review or ask a question through the form below. I will be using the air compressor in a closed room. What is the ventilation requirement for the room ? There is no special ventilation requirement for this air compressor because it is an electrical unit. It more depends on what kind of air tools you want to use with it. This item was discontinued in the U.S. any idea on a replacement soon?